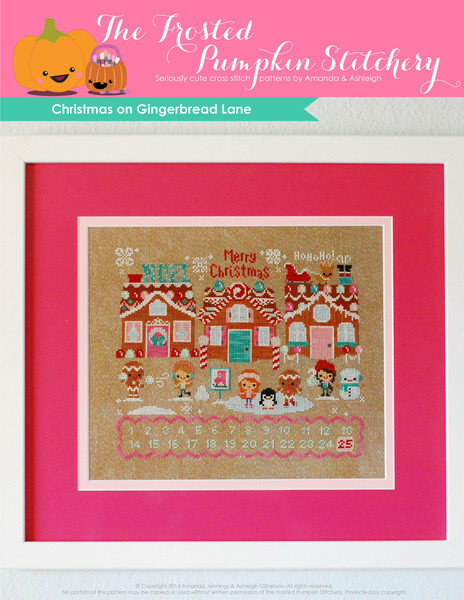 Ever since Pam pushed me off a cliff into the addiction that is cross-stitch (last year at the Handmade Fair) I've been slightly smitten with the adorable patterns of The Frosted Pumpkin Stitchery that she introduced me to. This is a small company formed by two friends in California, US; Ashleigh works on design whilst Amanda looks after the business side, making a brilliant partnership that creates colourful kawaii designs. 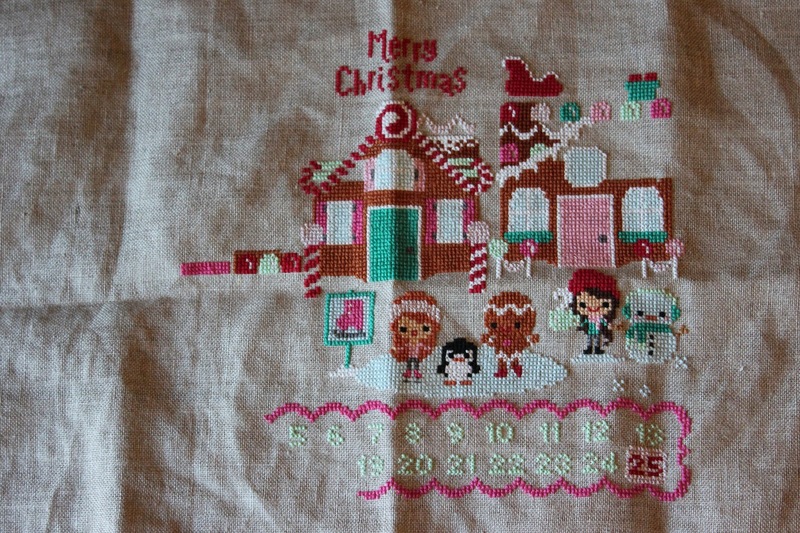 If you've read any of my 'Making' posts you'll have seen some of the bits I've been working on over the past few months, mainly Christmas themed as that was the time of year I started stitching. The ladies have a great back-catalogue of patterns including various seasonal samplers to cover any occassion you can think of, as well as a cute 'Pen Pals' series of small patterns that would be great for framing as gifts or making into cards. 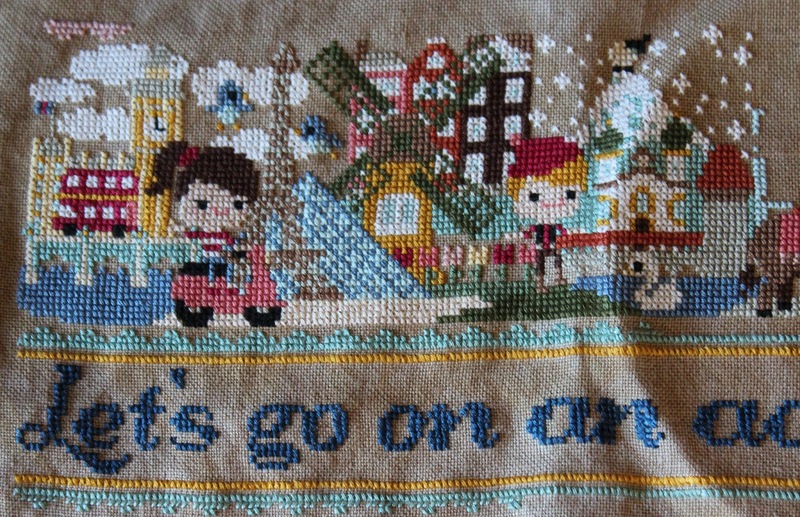 The best bits though, in my humble opinion, are the mystery stitch-along groups that you can sign up to. Each month everyone gets sent a section of a pattern that builds up over a few months or a whole year. This year there is a travel theme to the 'Pumpkin Passport' stitch-along and so far we've been to England, France, the Netherlands, Switzerland and Greece (which I'm currently working on). By some miracle I'm almost up-to-date and am super excited to find out what June will bring! The bit-by-bit approach makes attempting a larger piece a lot less daunting (especially for newbies like me) and there's a Facebook community filled with lots of other Frosted Pumpkin stitchers to help you out and give support along the way. I was a bit worried about purchasing at first because I was essentially paying for something I hadn't seen, but the Pumpkins haven't let me down yet! You can also look at and buy patterns from the previous stitch-alongs, and seeing how beautifully these have turned out is very reassuring. All the patterns are nice and straightforward to follow, with clear instructions and a clean, colourful design. Everything is available as a PDF download, meaning I don't have to worry about UK shipping, although they do sell full kits for certain patterns when stock is available. Having missed my deadline for last Christmas, I still have seven months to go until the next one - I'm sure I can finish it for then... right? 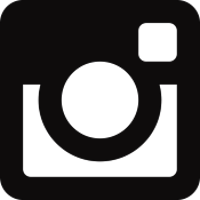 It's really great to see a business flourishing based on creativity and building a strong community, so I'm really happy to support them with my custom and this little blog post. I can't wait to see where they go next! 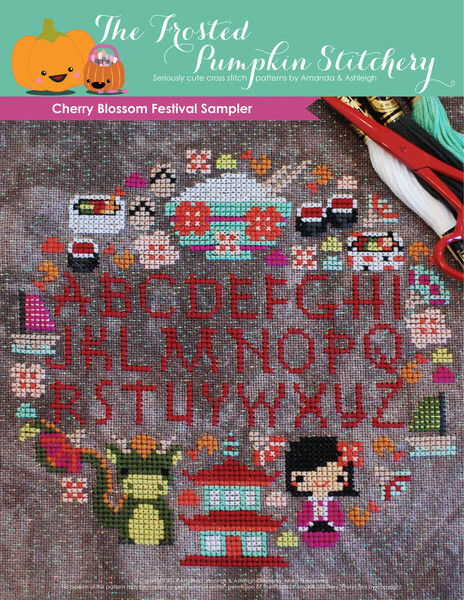 To help kick-start your stitching, the kind ladies at The Frosted Pumpkin Stitchery have offered to give two of my readers a PDF copy of a single pattern their choice (excluding their seasonal sampler bundle). I'm also throwing in my own prize of a reader's choice of any PDF pattern or patterns to a maximum value of $20 - enter below for your chance to win! This could be your chance to join me in working on this year's stitch-along - it's never too late to start!